I never hid my sexuality from anyone, or realise that everyone was not like me, until I learned that there was a special word for it. I cannot remember a time in my life that I did not know that I was bisexual. I had often been told as a child that I had a large capacity for love, that I was affectionate, kind and trusting. I rationalised that my sexuality was just an extension of this. My capacity for love was such that it could not be limited by gender identity. When asked how ‘coming out’ was for me, I often say that ‘I was never in’. However, looking back on my life I can see that I have come out many times over. I am still coming out now. As a bisexual person, I have faced macroaggressions that made me feel like I did not belong anywhere. I have also experienced Bi/homophobia, usually in the form of ignorance, “banter”, deeply ingrained and learned bigotry or inappropriate comments or questions. We can experience both homophobia from the straight community and biphobia/bi erasure from straight and gay communities. Biphobia is aversion toward bisexuality and bisexual people as a social group or as individuals. People of any sexual orientation can experience or perpetuate such feelings of aversion. My local network is small. Almost all of my friends are straight and there is not much activity in my local LGBTQ community. Since I joined the Justice Digital & Technology directorate I have been overwhelmed by the diversity and inclusion work taking place, and vocal senior managers showing support. We are fortunate that there is a real drive to push for visibility, diversity, and normalising, and this seems to have a lot of support from allies/senior managers. I have been inspired and encouraged by the LGBTQ heroes who put so much of themselves into building and supporting the community and actively make the civil service a better place to work. But there are far fewer ‘out’ LGBTQ staff in the regions. Recently, I learned that a survey found LGBTQ people in East Midlands (where I am from) felt the least comfortable coming out. I feel I am able to be myself at work. I have recently made a conscious effort to be a more visible bisexual person in the hope that others will feel more comfortable and open about their sexuality and gender identity. People are happier and work more effectively when they can bring their ‘whole’ selves to work. 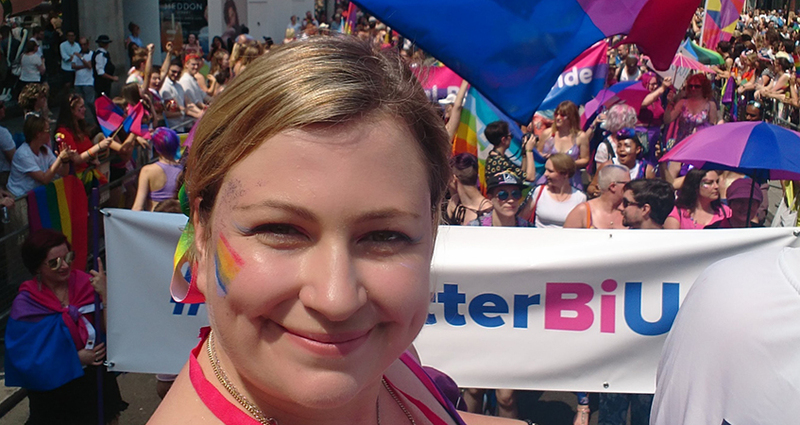 I recently took on the role of Chair for the MoJ LGBTQI+ Staff Network, Spirit. While I am settling in I have been thinking about what I would like to achieve in this role. In the future I would like to see an increased presence of senior LGBTQ role models, especially in the regions. We should promote a greater take-up of network mentoring and reverse mentoring programmes to build the skills and confidence of lower grade staff and develop inclusive leadership. I would also like to encourage stronger and more visible LGBTQ networks in the regions with tangible and vocal support from local management. I learnt later in life that you should never underestimate the importance of supportive colleagues. When you are openly accepted it makes everyone feel that they can be confident and themselves. Being part of a supportive community also has a positive impact on many aspects of life, from emotional well-being and quality of life, all the way through to mental health. I feel very fortunate that in the Civil Service we have so many great communities available to us. I live my life knowing that I might never be accepted by everyone I encounter, or always seen for who I am. But I will never stop ‘coming out’, I will never be anything other than my whole self. I am a proud bisexual woman. And I want other bisexuals to know…I see you. Christine Boden - Spirit Chair. Loud, Proud and Visible Bisexual. Find out about the great support, information and events join the Spirit Network to receive regular updates, or you can also follow Spirit, PiPP and Civil Service LGBT+.